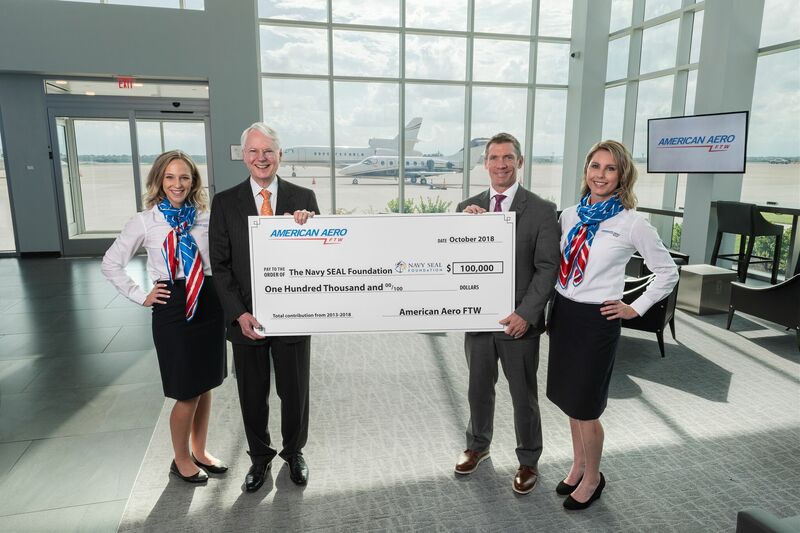 FORT WORTH, Texas (September 27, 2018) – American Aero FTW, a fixed base operator (FBO) at Meacham International Airport in Fort Worth, Texas, marked its sixth annual charitable contribution to the Navy SEAL Foundation with a $25,653 donation—and two major milestones. This year, the FBO’s total donations since 2013 topped the $100,000 mark, and three SEALs have received pilot training scholarships under the American Aero FTW matching funds program. American Aero FTW’s donations allowed the Navy SEAL Foundation to launch a new scholarship last fall. This year, two active duty and one retired SEAL have used the scholarships to advance their desire to pursue pilot certification. The tuition reimbursements were applied to FAA Rotary Wing Pilot Commercial Add-on, Rotorcraft-Helicopter Private Pilot, and Commercial Pilot Aviation Instrument Rating certifications. The new scholarship helps fill a gap in funding from the GI Bill. The donation comes from the American Aero FTW “Red, White and Blue” program, which enables customers and vendors to contribute. The FBO matches those donations dollar for dollar and provides additional funding to the Navy SEAL Foundation. In 2018, American Aero FTW was ranked the #1 FBO in Dallas/Fort Worth and among the top 5 percent of FBOs in the world in the AIN FBO Survey. The FBO also supports an annual holiday toy drive for Toys for Tots, donating hundreds of bicycles and toys to children in need each year. American Aero FTW Founder Robert M. Bass and Navy SEAL Foundation Director of Development Chris Irwin celebrate the FBO’s milestone donation to the Navy Seal Foundation. Since 2013, American Aero FTW and its customers have contributed $100,000. Funding is earmarked to support SEALs to interested in earning pilot certification. Also pictured (L-R), American Aero FTW Customer Service Representative Miranda Hodges and Assistant General Manager Angela Thurmond. The Navy SEAL Foundation supports all active-duty Naval Special Warfare (NSW) personnel, including U.S. Navy SEALs, and their families stationed all over the world. It provides critical programs for NSW Gold Star families and NSW veterans. In 2017, over 14.5 million dollars was invested in program support for these warriors and their families. Like the community it serves, the Navy SEAL Foundation is a high performing organization committed to excellence. NSF has received seven consecutive 4-Star ratings from Charity Navigator. It is one of only 60 charities from among more than 9,000 to have earned a perfect score of 100 for our financial health, accountability and transparency, placing NSF in the top 1% of the rated charities. Ninety-four cents of every dollar donated goes directly to programs or is retained for future mission use. The Navy SEAL Foundation is a 501c3 national non-profit charitable organization. TAX-ID 31-1728910. NSF is a non-federal entity and is not a part of the Department of Defense or any of its components, and it has no governmental status. Visit the Navy SEAL Foundation Online.